A big part of marketing has to do with finding new leads, qualifying them, and then sending sales-ready leads to salespeople. To help you identify the hottest leads, Dynamics 365 for Marketing scores each one based on criteria that includes each lead's demographic details and interaction record. A lead who meets your target demographic profile and has interacted with your marketing materials (for example, by opening emails, registering for downloads, browsing your website, or attending an event) will probably get a high score, provided you've set up your scoring model correctly. You can create any number of lead-scoring models, with each lead being scored according to each model. That means that if you have several models, each lead will also have several scores. A lead becomes sales-ready as soon as at least one model produces a sales-ready score for that lead. Go to Marketing > Lead Management > Lead Scoring Model. This takes you to a list of existing models. On the command bar, select New. The New Lead Scoring Model page opens, with the Design tab shown. This designer is similar to other designers in Dynamics 365 for Marketing. You use it to build scoring models by creating a collection of condition/action tile pairs, where the Condition tile establishes a condition (such as email opened) and the Action tile establishes how the score should change when the condition is met (such as, add 50 points). Drag a Condition tile from the Toolbox tab to the first position on the canvas. When you drop the tile, it stays selected and the Properties tab opens to show its settings. In this case, the only setting is a name for the tile. You're going to create a condition that looks at the city where a lead is living, so set the Display Name to City. Expand the new Condition tile by choosing the expansion button in its lower-right corner. Here you can see that your new Condition tile already has a child Condition tile. The parent Condition tile simply establishes a name for the stack, whereas the child establishes a logical condition. If the child condition resolves to true, the lead score will be updated as specified in the Action tile that follows (you'll add that in a few minutes). Select the child Condition tile, open the Properties tab, and then enter a Display Name for the tile. You're going to increase the score for leads from London, so name it something like City of London. You can add more child conditions by dragging more Condition tiles onto the same parent. If you do this, all child conditions are combined with an AND operator, which means that all of them must evaluate to true for the following Action to be applied. Select in the Entity field to place the insertion point. 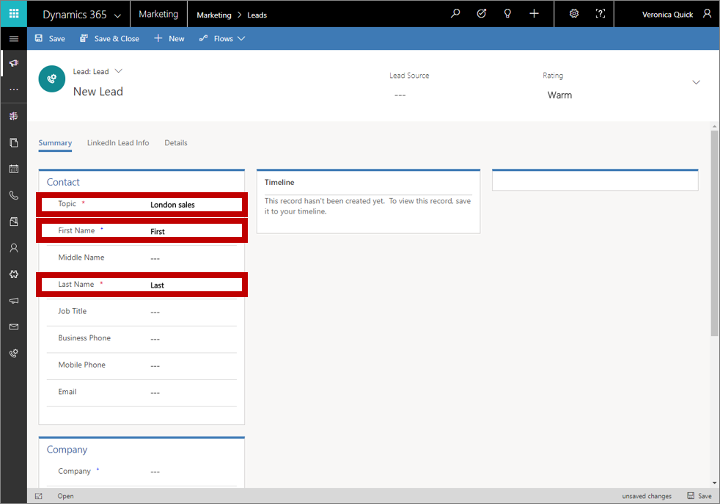 Dynamics 365 for Marketing fetches a list of scorable entities (which can take a few seconds) and displays them as a drop-down list. The list includes all relevant entities that can be related to a lead record, plus the lead entity itself. You're looking for the name of the city where the lead works, which is recorded on the lead itself, so choose the Lead entity here. After you've chosen an Entity, an Expression box is added that provides choices appropriate for that entity. 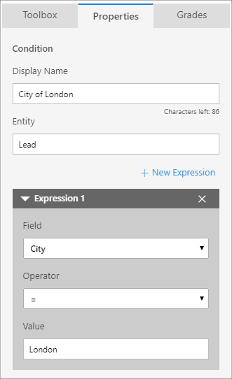 Use the Field, Operator, and Value fields here to establish an expression that evaluates to true where City = London. You can add more expressions here by choosing + New Expression. Drag an Action tile from the Toolbox tab to the space immediately to the right of the Condition tile you just set up. When you drop the tile, it stays selected and the Properties tab opens to show its settings. This is where you set how a lead's score is changed when the Condition resolves to true. Set Score Update to +70. The rule will now give 70 points to any lead working in London. By using a process like the one you used to create the first rule, add a new rule below the first one and set it to give +40 points to leads living in England (check the Leads entity where Country/Region = England). When your model includes several rules, like this one does, each rule can affect the lead score independently. For example, the model you built so far will increase a lead score by 110 points for leads who live in London, England. Likewise, leads from Manchester, England will get +40 points and leads from London, Ohio will get +70 points. Open the Grades tab in the rightmost column. You can use Grades to establish a schedule of grades associated with each of several score ranges, but the most important setting here is the Sales Ready Score. When a lead reaches this score, the system will consider it sales-ready (marketing-qualified) and therefore ready to be forwarded to a salesperson for further attention. Let's suppose that any lead located in London, England is sales-ready, so set this to 100. You can add any number of additional grades to help classify a lead according to its score (such as 0-25=Cold, 26-60=Warm, 61-100=Hot). Choose + New on the Grades tab to add and define each required grade. Go to the Summary tab and give your rule a Name (such as "London, England"). On the command bar, select Save to save your model. On the command bar, select Go Live to activate the model. Dynamics 365 for Marketing runs a final error check, and then updates the Status Reason to Going Live. It might take a few minutes for the process to be completed, at which time the Status Reason will change to Live. Go to Marketing > Lead Management > Leads to open a list of available leads. On the command bar, select + New to create a new lead. In the Contact section, fill out the Topic, First Name, and Last Name fields. The values aren't important for this exercise. In the Company section, set the City to London and the Country/Region to England. When it's saved, the page is refreshed and a business process flow (BPF) is added at the top of the page and several new sections are added to the body. 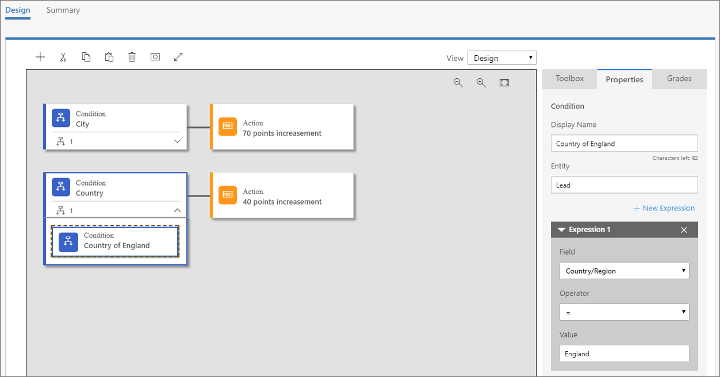 Choose the first step of the business process flow to open its menu, and then make an assignment in the Existing Contact? field. Choose any contact you can find—the one you choose isn't important for this exercise. Then save the lead. The associated contact is now listed in the Stakeholders section for the lead. Automatic lead scoring only works for leads that are associated with a contact. Scoring fails for leads that don't have a contact associated with them. 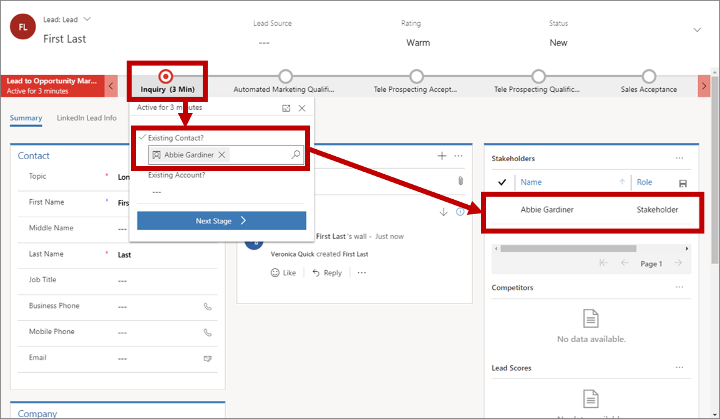 Also, segments in Dynamics 365 for Marketing can only include contacts, not leads, which means that you can only address marketing emails to contacts. Your landing pages will typically either create a lead/contact pair when you create a new contact, or associate new leads with existing contacts when they're available. But when you create a lead manually, as you did here, you must also associate it with a contact manually to enable lead scoring. Look for the Lead Scores section near the lower-right corner of the page (you might need to scroll). Each lead scoring model is listed here, including your new one. It might take a few minutes for the score to be calculated, but after it is, you should see that it shows a score of 110 points.